Samford students Ann Potter and Keely Smith interview celebrated chef Scott Peacock at his home in Perry County, Alabama. 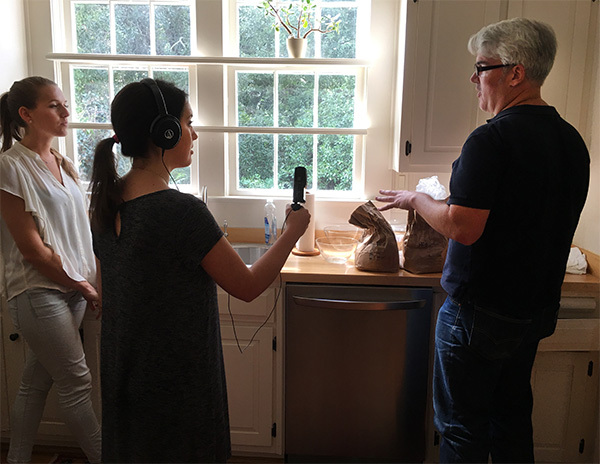 The Samford Traditions & Oral History Recording Initiative (STORI) at Samford University recently posted the last of four student-produced podcasts that explore some of the diverse food traditions found in Alabama. So far, the podcasts have been downloaded more than 900 times by curious listeners around the world. In 2015, Mauldin proposed a Food and History course that any professor in her department could teach, adapting it to personal scholarly specialty. She led the first course in fall, 2017. “I wanted to introduce the ways American identity and American food have often been linked, and how they’ve changed over time,” Mauldin said. She also wanted to explore the ways digital humanities could be integrated into the application of historical knowledge. “Instead of just writing a research paper, which history students do in almost every class, I wanted to do something that showed students how you can apply the themes of the class in a more practical way, particularly since we had a range of majors,” she said. She invited STORI director Michelle Little and student podcast producer Claire Davis to collaborate on an oral history component, guiding the students through the techniques and technologies of interviewing and podcasting. “I was so lucky to have Michelle in class as a way of professionalizing what we were doing, but also so we could experiment with how oral history could be integral to coursework,” Mauldin said. “This project, particularly, got me interested in how interviewing and food go so well together,” Little said. She joined Samford nutrition and dietetics professor and Food Labs Director Pat Terry, and students Ann Potter and Keely Smith in Marion, Ala., as the students interviewed James Beard award-winning chef Scott Peacock. She learned that Peacock, one of Southern Living magazine’s 60 Southerners of the Year for 2017, also interviews people about food and also finds that talking about food “is the perfect segue into any topic,” putting people at ease and opening the door to powerful memories of home, family and culture. “That’s why oral history was so right for this class,” Little said. Mauldin divided her 22 students into teams of two each, to create 11 projects focused primarily on immigrant foodways, including Malaysian, Filipino, Nigerian, Chinese, German and Italian traditions, but also including Peacock and women who prepare dinners at Shades Mountain Baptist Church. In addition to the hours of interviewing and transcription, the students had to write scripts, produce podcasts, cook selected recipes, read at least 100 pages per week, complete a short paper each week and write 10-page research papers on subjects related to the cuisine they explored. Students embraced the challenge. “The most common thing I saw in the evaluations apart from ‘this was a lot of work,’ was ‘this has totally changed the way I look at what I eat’,” Mauldin said. Lawson and classmate Spencer Bissell interviewed Nigerian Samford student Amam Rochas for their Food and History project. “Not only were we able to discuss Nigerian cuisine and the impact it has had on Amam’s life, we actually prepared two traditional dishes, drinking gari and fried plantains, with Amam in his apartment,” Lawson said. “It was an incredible experience."